We love the Forgive blend for its fresh, woodsy scent. As with all doTerra oils, its comprised of only the highest quality, Certified Therapeutic Grade oils. The blend contains Spruce leaf, Bergamot peel, Juniper berry, Myrrh resin, Arborvitae wood, Nootka tree wood, Thyme leaf and Citronella herb. Research increasingly supports the anecdotal reports that Aroma Therapy helps reduce stress, anxiety (and the associated need to medicate for these) and even physiological responses like high blood pressure. Dr. Rena Szabo is the Director of Psychology at an Oncology clinic. She conducted a 10-month study amongst the nursing staff at her clinic. She had the staff complete a detailed survey of their emotional state with no oils being diffused, and then with six different essential oil blends being diffused to validate her research. 60% said they felt “overwhelmed” by work before she started her testing. After her study was concluded, only 30% stated they felt overwhelmed at work. Of the six blends she used, Forgive was the rock star. Staff reported feeling more happy, positive, and relaxed while Forgive blend was being diffused. IN addition, they reported feeling less tired, and less anger and frustration. 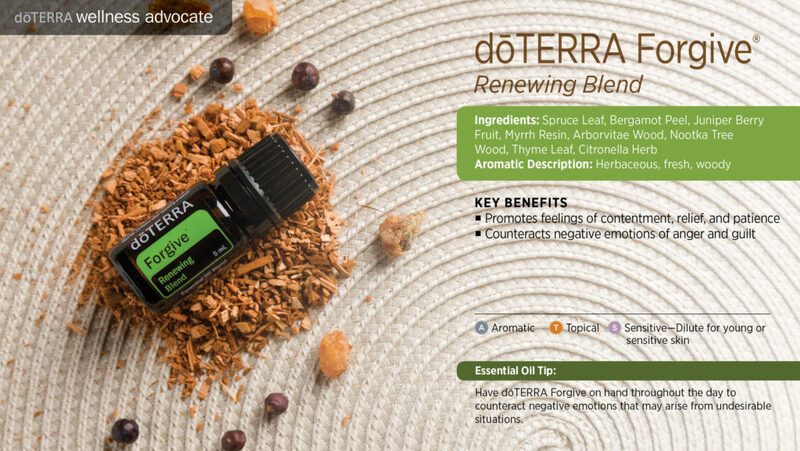 To learn more about how doTerra essential oils could be part of your healthy living choices, contact us today! Tell us what you would like to know more about.